Miesha Tate, did what she was does best. She came back. In one of the most dramatic title finale’s in UFC history, the former Strikeforce champion choked bantamweight queen Holly Holm unconscious and with it put to sleep her lucrative rematch with Ronda Rousey. Holm looked well on her way to making a first successful defence of the belt she stripped from Rousey back at UFC 193. She edged a tentative first round and survived nearly being finished by a rear-naked choke in the second to show remarkable composure in the third before finding her range and rhythm in the fourth. “The Preacher’s Daughter” stuffed every Tate takedown attempt from the second round up until the fateful finale. But when the challenger scrambled in the centre of the cage, she grabbed onto Holm’s back, sneaking her arm under the champion’s chin. When she desperately tried to break free, front flipping to the ground, Tate latched on as Holm went out on her shield, refusing to tap before being choked out cold. It’s a victory a long time coming for “Cupcake” who has been a major player in helping to establish women’s fighting. She admitted late last year that she toyed with the idea of retirement after seeing an initially promised title shot given to Holm. Now, though, she has options and a third fight with Rousey looms. 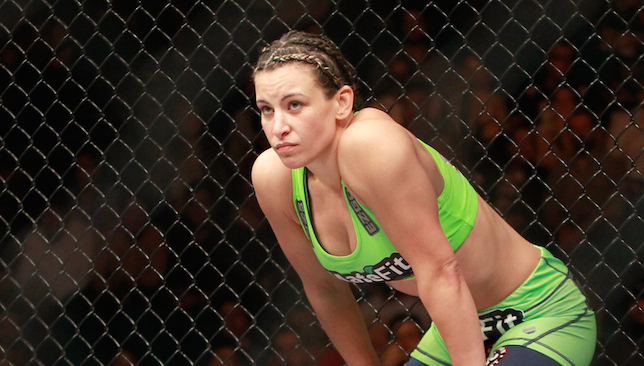 “I knew I had to finish the fight,” said Tate who has lost twice to Rousey at UFC 168 and in Strikeforce. The defeat means Holm is now the one chasing a rematch, not Rousey, who made no secret of her desire to avenge her one blemish. “I want to fight Miesha tomorrow,” Holm said. “Everyone before this fight was saying, ‘Why are you taking this fight? You should be going for the rematch.’ You know what, I’m in it to fight. It also cost her a lucrative rematch after UFC president Dana White confirmed that the new 135lbs champion will face Rousey next. Raising the bar: Abu Dhabi Jiu-Jitsu Championship has prize money of Dh2.5m. A top UAE official insists the Abu Dhabi World Professional Jiu-Jitsu Championship should be considered as the sport’s best global tournament after details of its biggest ever edition were revealed. attracting youngsters to the sport. For the first time in the tournament’s history, current and retired legends will also compete in exhibition matches. With a prize fund of more than Dh2.5 million and with more than 4,000 competitors flocking to the capital, Fahad Al Shamsi, UAE Jiu-Jitsu Federation’s chief executive insists the eighth edition will raise the bar. “The event can certainly attract a lot of attention and will give all the mileage that the sport needs around the globe,” he said. “It’s a great chance for everyone to learn more about the sport and be involved. It’s not only a competition. This is the history of the sport. What we want to do is not just consume the sport, we now want to take it a level up. Defending Open champions Marcus Almeida and Mackenzie Dern, who triumphed in the men’s and women’s categories last year will defend their titles at the IPIC Arena. Another competitor taking to the mat is Brazil’s Marina Ribeiro. After winning gold on the Abu Dhabi Slam twice this season, she is eyeing another in the capital. “It is a very big platform for us. I wasn’t training much last season but this year I’m ready,” she said. 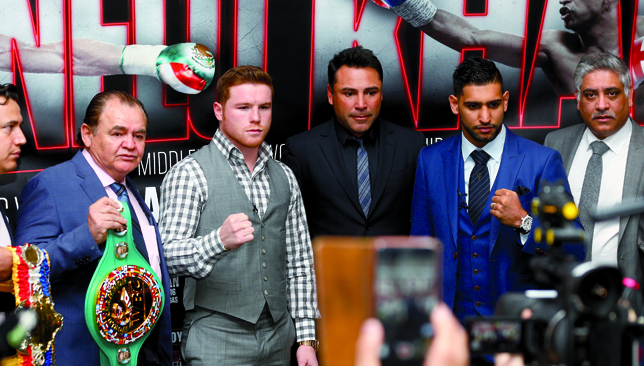 Mexico’s Saul Alvarez (l) and Britain’s Amir Khan (r) in London. Khan will fight above welterweight for the first time at a catchweight of 155lbs, officially middleweight, to challenge Alvarez for the Mexican’s WBC title at Las Vegas’ T-Mobile Arena. Given the significant difference in size between challenger and champion when they appeared together in London Monday, it appeared a risky oversight that Khan did not demand a restriction on Alvarez’s weight on fight night. The Mexican’s frame means there is little to stop him gaining a further 20lbs after weighing in to effectively compete at light-heavyweight and therefore leaving Khan, the underdog who turned professional as a lightweight, at an even greater disadvantage. There is no question Khan’s best chance comes in using his superior speed and mobility against his stronger opponent, so asked why he took such an unnecessary risk, he said: “I want to do everything naturally because when I beat him I want to beat him fair and square. I don’t want people thinking ‘he was dehydrated, he was small, he couldn’t put weight on’. “Yeah (we considered a clause), I spoke to Virgil (Hunter, my trainer), and Virgil is the one who said to me ‘look, if you’re happy with the fight, it’s a good fight for us’.